If you have heard of some of then, sue us. But in all seriousness, we hope this is educational and comes in an easy-to-consume format. Subscribe here. Lawrence, Kansas is 41 miles west of Kansas City. The weather in Lawrence on February 4, 1915, was “generally fair,” though there was a chance of snow in the “west portion” that night. Edith Channel was walking west, into that snow. 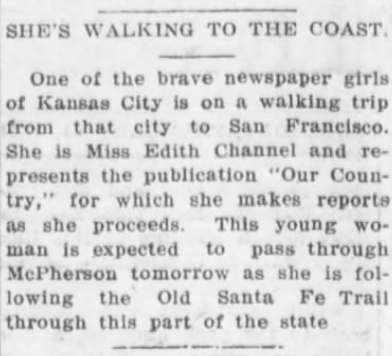 There are no reliable, current records of a publication titled “Our Country” based in Kansas City in 1915. At least, there aren’t any easily found online. 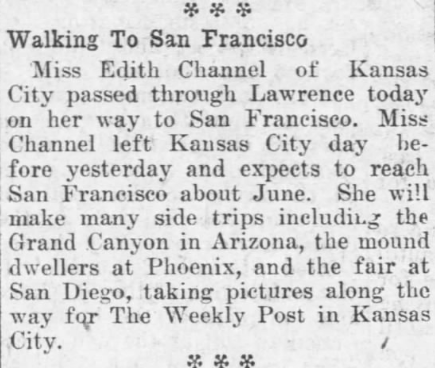 The Weekly Post in Kansas City was a real paper. It began publishing in 1912 and continued through the 20s.